How to find every Golden Balloon this week. 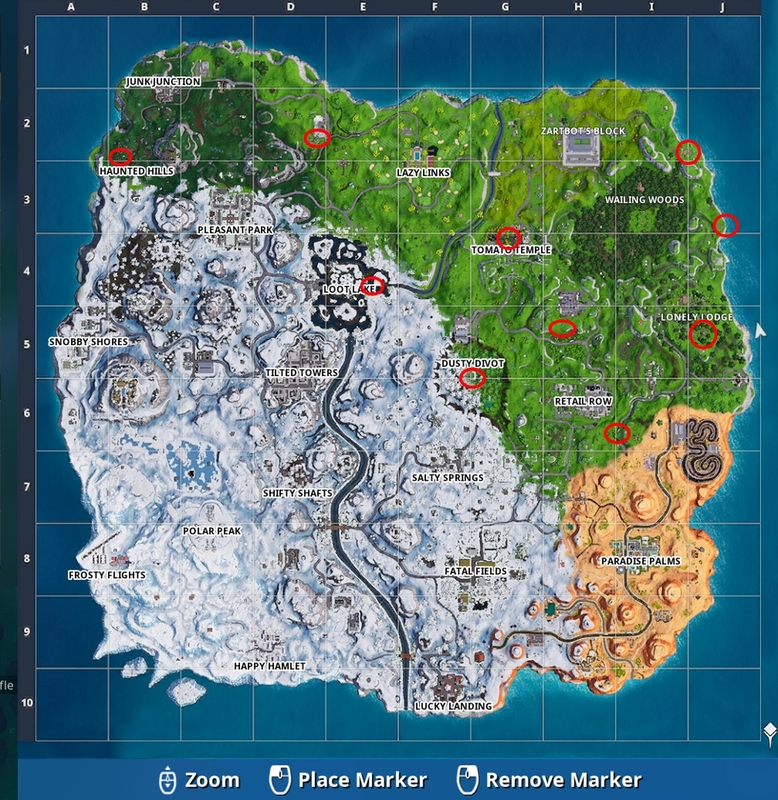 How to find all Golden Balloon locations in Fortnite for this Season 7 Week 9 Challenge. If you want to nab all the Battle Stars on offer this week, then you’ll want to go ahead and complete this Week 9 Challenge which tasks you with popping a total of 10 Golden Balloons. You’ll find these shiny inflatables dotted around Fortnite’s map in some pretty obscure locations. They’re certainly not easy to find, especially for those who aren’t too familiar with the game’s locales. To help you get this challenge done without any fuss, we’ve put together a guide to finding all 10 Golden Balloons on Fortnite’s map. Thankfully YouTuber HarryNinetyFour has made things even easier. We’ve embedded his video below which showcases all of their locations, and included a quick text summary for those of you who can’t watch the video for whatever reason. Balloon #1: Northeast of Wailing Woods, on top of the house by the cliff. Balloon #2: Southeast of Wailing Woods, by a lorry hanging off a cliff edge. Head south from balloon number one. Balloon #3: On the large wooden tower just south of Lonely Lodge. It’s about midway. Balloon #4: Southeast of Retail Row, on the back of a bear statue. Balloon #5: North of Retail Row, attached to the bottom of an electricity pylon. Balloon #6: Right in the center of Tomato Temple, tucked in the middle of a grey stone pillar. Balloon #7: Right in the center of Dusty Divot, hanging just above a leaf covered building. Balloon #8: East of Loot Lake, on a sunken canoe by a large rocky hill. Balloon #9: Right in the middle of the Motel sign, west of Lazy Links. Balloon #10: Western Haunted Hills, on top of a building directly opposite the church.